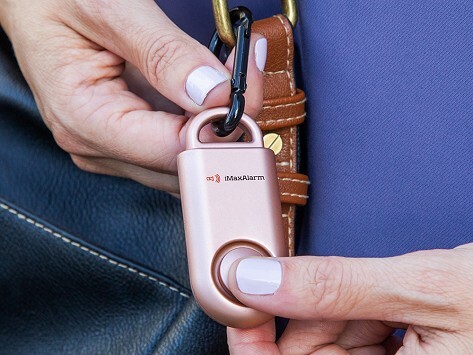 Designed to mimic a standard key fob, this keyring alarm is small but sounds a powerful call for help. Pull the top for an ear-splitting 130-decibel alarm that is as loud as a jet taking off. Pop the top back in to stop the sound. It’s reusable and can attach to a bag, belt, keychain, or be worn around your neck—perfect for students, apartment dwellers, campers, joggers, or anyone who wants an extra measure of safety on-hand. Please note: Not a toy, 130 dB frequency can cause hearing impairments. For use in emergency situations only. Dimensions: 2.8" x 1.2" x 0.5"
I purchased two, for my daughter and myself. My grandson's girlfriend just started college and was excited to get this. CARRY ON MY PURSE. HAVEN'T HAD TO USE IT. BUT PREPARED JUST IN CASE.